I don't usually view the cam at night. 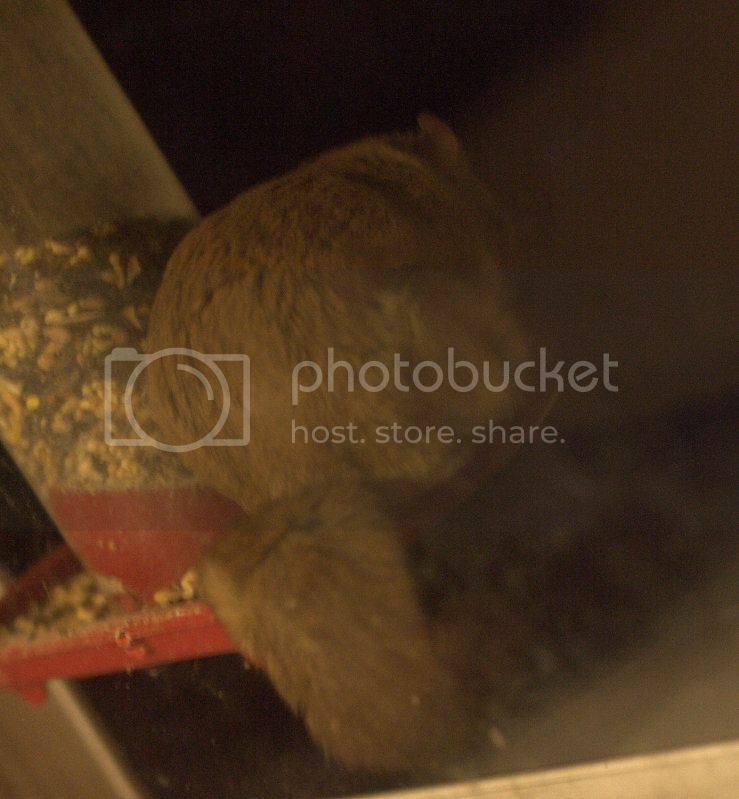 Typically the only time I see the cam after dark is when I run outside quickly to refill the seed. Last night, my husband wanted me to go downstairs to help him with his mountain bike. The cam and feeder are by the window in that room. I happened to glance up at the feeder and saw a squirrel. "What on earth is Scramble doing at the feeder this time of night??" I questioned. I got closer to the window to investigate. It didn't really look like a red squirrel. It looked more grey and softer. "Wait a second," I told my husband, "what is this thing?" We could only see it's back side, but from that, my husband said, "That's a flying squirrel!" He pointed out the squirrels little winged arms which we could catch a glimpse of when he turned sideways to get more seeds. Suddenly it all made sense! Flying Squirrels are nocturnal and only come out at night. They can glide from tree to tree. I really wish I could have got a picture of his face, but it was really hard to get any type of picture through glass, at night, so alas, I only got a picture of his back. I wonder how long he's been visiting? I hope he continues to visit our feeder. Maybe at some point I will be able to get a night-vision cam so he can be viewed in the evenings. Now that would be awesome! I guess I need to start saving some $$$$!